What are some approaches that artists use to inspire themselves? After much navel-gazing and chatting with students and colleagues I wish to propose that there are three fundamental approaches for creative invention: verisimilitude (i.e. using an observed subject as a platform for creative replication of it in an artistic medium), interpolation (i.e. portraying a subject in a way that adds fresh meanings to the subject’s original meaning) and fountainhead (i.e. an approach like Cozens developed where a subject of fixation becomes the point of departure—“ground zero”—for a creative leap to a subject that may be far removed from the original). The following discussion explores these three approaches by examining how different artists (Charles Cousen [c. 1813–89], Timothy Cole [1852–1931], John Park [1851–1919] and I) have used Constable’s painting, The Cornfield (1826), as a subject for their personal artworks. Let me begin with the verisimilitude approach. Looking back to the prints by reproductive printmakers of the nineteenth and earlier centuries, these artists’ interest in the process of copying paintings, sculpture and drawings often went beyond a singular desire to create close pictorial resemblance. For instance, Franklin Robinson (2005) perceives in the seventeenth-century Dutch printmakers’ reproductive prints a desire “to possess the object itself, in a heightened, intenser form” (p. 5). Whether the motivation is to psychologically “possess” the subject, to see and understand it better by close scrutiny, or simply to fulfil a contract, there is a very real and practical necessity for all artists engaged in making reproductive prints to tap into their creativity to translate the addressed subject’s form, colour and surface texture into a meaningful image. In Charles Cousen’s engraved replication of The Cornfield (shown below), for example, he has converted the colour-tones of Constable’s oil painting into a grey scale of tones through a complex layering of lines. 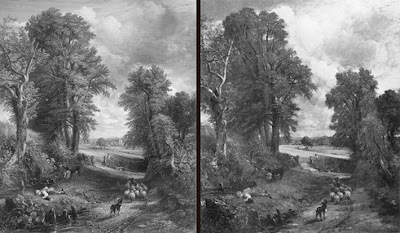 A broad comparison of Cousen’s engraved replication of the painting’s colour-tones (see further below) reveals his keen eye—mindful that Cousen was not able to click a button in a digital program to make the conversion as we can today. Interestingly, Cousen’s tonal interpretation of Constable’s painting is much more creative on close examination. For example, Cousen has manipulated (i.e. “toyed with”) the tonal contrasts within the trees to help a viewer’s reading of the trees as three-dimensional forms. Of particular interest to my eye is his reconfiguration of the tones within the clouds to create a strong upward rhythm that may be seen to give the cloud mass a forward projecting and (again) greater three-dimensional form. Beyond Cousen’s conversion of the painting’s colour-tones to greys, he also shows creative invention in his mimetic representation of the oil painting’s textures. Consider, for instance, his juxtaposition of mechanically engraved marks portraying the sky (see detail below), designed to suggest a comparatively smooth application of paint, with the scribble-like marks portraying the foliage, designed to suggest freely laid and thick paint. Of course, there is always the question of the degree of mimetic translation that an artist wishes to engage in. 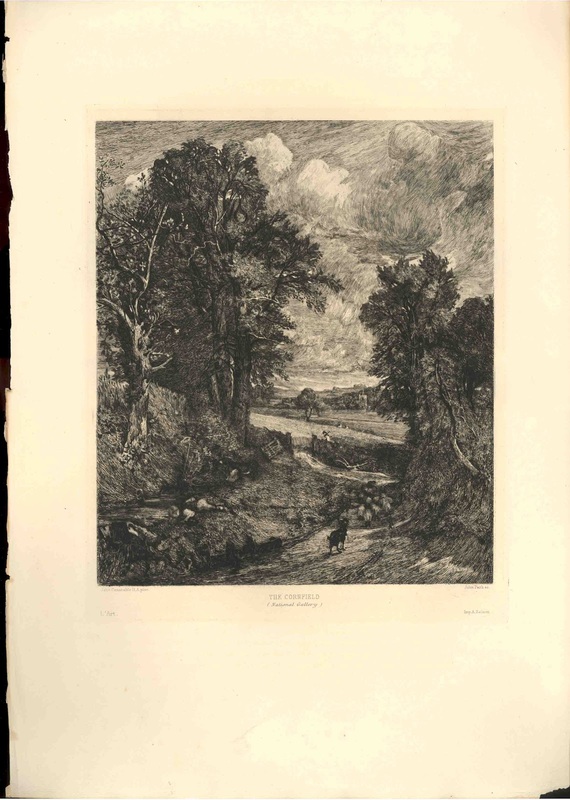 For example, compare Cousen’s approach with Timothy Cole’s much more inventive approach to creating a faithful copy of Constable’s The Cornfields shown below in his wood engraved version. In Cole’s print the original painting is now converted into a pattern of negative (white) marks resulting from the relief (i.e. raised) printing process. These negative marks with their complex arrangement and variations of shape reveal an even more codified pattern than exhibited in Cousen’s print. In the detail shown further below, see how Cole’s creative invention in the reproduction of Constable’s sky is now a carefully calculated optical pattern of closely aligned curving stokes that at one moment appear to be negative lines and at the next moment are seen as positive (black) lines. Going further, Cole has portrayed the expansive plane of the sky region as optically energised by the sinuous flow of these lines. By contrast to this flow, also note how he has synthesised the texture of the foliage into wedge-shaped dots that to my eyes present a convincing approximation of the facture (i.e. 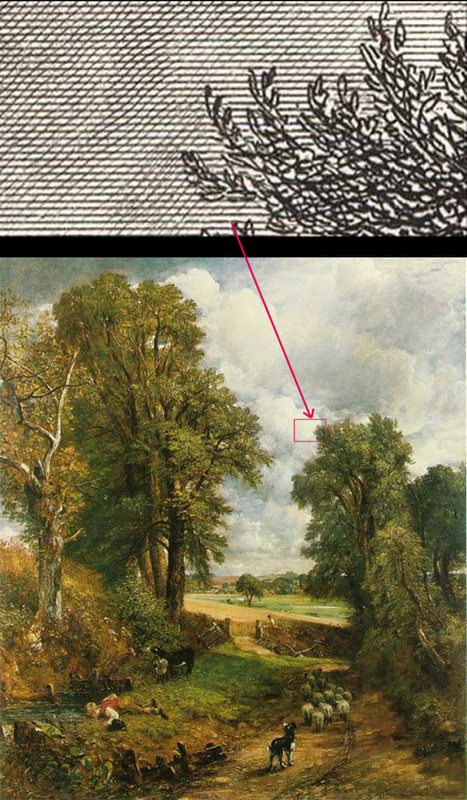 the handmade physicality) of Constable’s brushwork. Mindful that most artists are not prone—perhaps even unable—to disengage their personal interests and sensitivities when portraying a subject objectively, the approach of verisimilitude in achieving what the OED defines as “the appearance of being true or real” needs a caveat to allow for an artist’s personal perception of what constitutes truthful representation. From the standpoint of allowing such a caveat, this means that an artist is liberated from a strict and soulless copying of a subject’s superficial pictorial reality and can portray an interpretation of truth based on the dimensions of the artist’s perception of the subject. Regarding the interpolation approach where an artist adds fresh meanings to the subject’s original meaning, this is different to the last approach in that here the artist intentionally changes the original subject to project a personal perception. 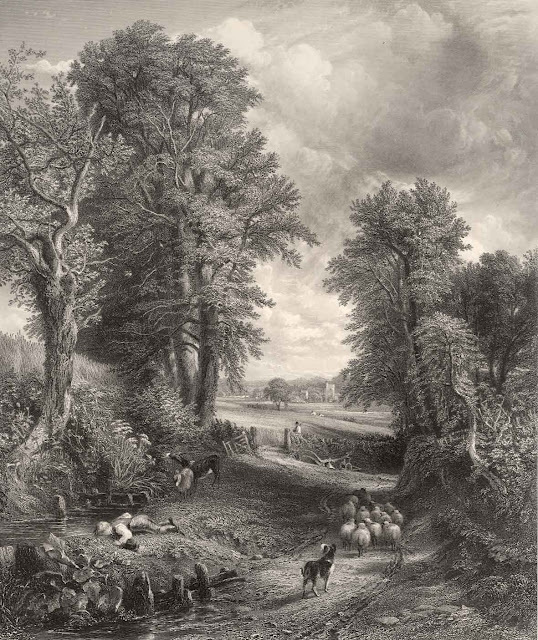 For example, in John Park’s print of The Cornfields (shown below) the image may be instantly recognisable as matching that of Constable’s painting but Park has changed the essential mood (i.e. the projected emotional tenor) of the painting with swirling line work in the sky (see detail further below) and a darkening of the painting’s tonal key. As a result, this print projects turmoil and drama. 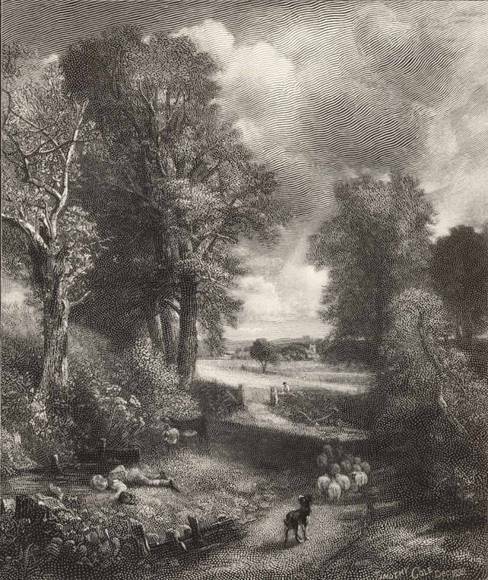 It is not the same view of landscape as a calm place where a shepherd boy can calmly drink that Constable presents. 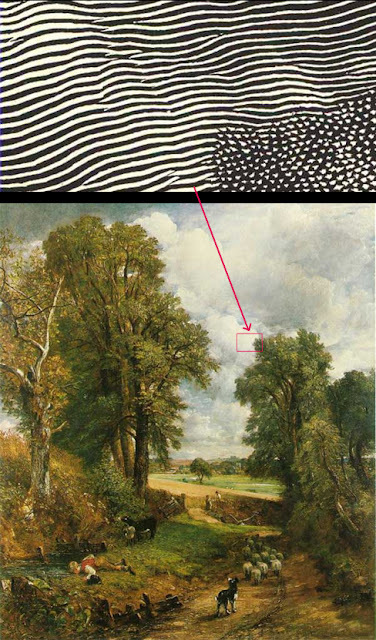 In short, Park has creatively reinvented Constable’s painting as his own artwork. Condition: very rich impression with a faint stain 5 cm from plate mark in lower margin and a small clipped lower-right corner otherwise in pristine condition. I am selling this print by John Park along with the two above prints by Charles Cousen and Timothy Cole after Constable’s The Cornfield for a total combined cost of $110 AUD including postage and handling to anywhere in the world. Please contact me using the email link at the top of the page if you are interested or click the “Buy Now” button. Regarding the final approach to creativity—the fountainhead approach—I have decided to discuss my adaptation of Constable’s painting as a way of illustrating how an original image can serve as a pictorial launch pad for one’s own artistic practice. For me, there are few images that are more closely identified with the English landscape than Constable’s The Cornfield. For some historically-minded viewers it epitomises an idealised view of English rural life a few centuries ago. Moreover, it for foretells the developing interest in the effects of light by the tiny flecks of white that Constable scattered through the areas of foliage to capture the sparkle of light glinting on leaves—commonly referred to as “Constable’s snow.” My interest, however, lies with the “U”-shaped composition of the painting and it is this component of his painting that became my point of departure for my very free adaptation of The Cornfield (shown below). Specifically, my fascination lies with Constable’s curious blend of Western conventions of composition that invite a left-to-right reading and the conundrum posed on such a reading by the direction of light coming from the right and the arrangement of trees that invite a right-to-left reading. In Referencing Constable I explored what would happen if the composition were mirrored (i.e. pictorially reversed) so that the direction of light and the arrangement of key features encouraged a left-to-right reading that is more in keeping with the Occidental way of reading. 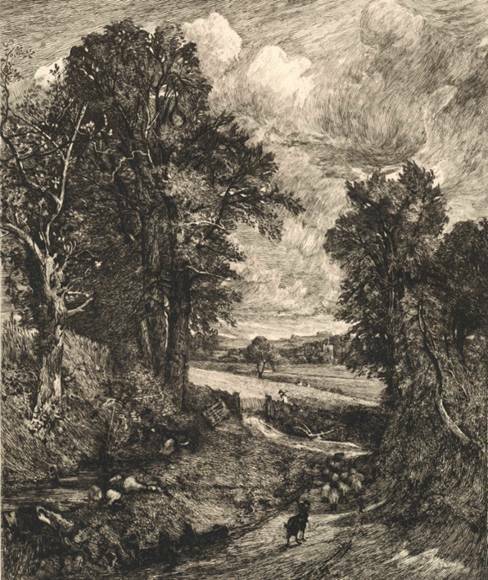 Beyond the reconfiguring of Constable’s composition this is not an attempt to revive Constable’s view of the English landscape. 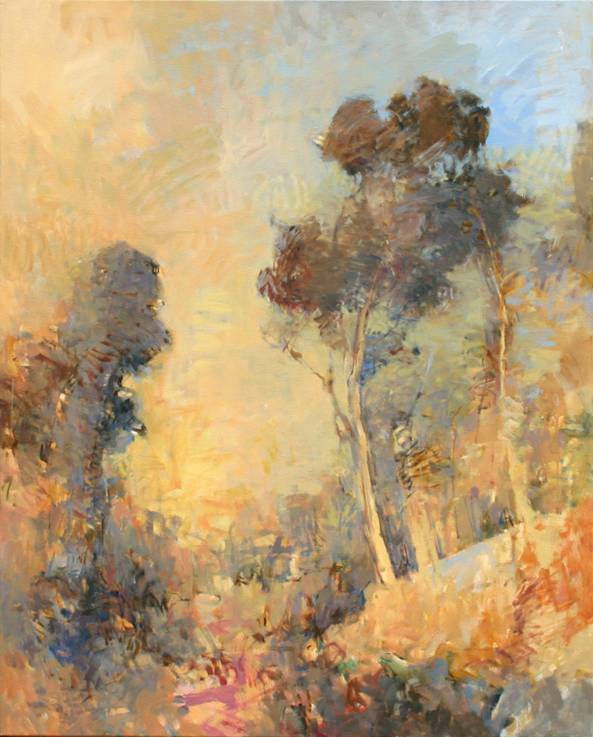 My painting revises—probably closer to obliterates—an Englishman’s view of an English landscape and offers instead a North Queenslander’s view of the region I am most familiar: the hot dry tropical landscape of Australia. Can you enlighten me? I cannot find it on Pettie's list of art works anywhere Thank you. Thanks for your query and the answer is easy: Cousen is one of the better known reproductive engravers and his name on the print lets the viewer know that Cousen "did" the engraving following the design by John Petite.